What is The Queens Birthday Parade? What lies behind this annual celebration by five Regiments of Foot Guards, essentially a private ceremony in a public place, showing, through historic military drill, their personal duty to their Sovereign and Colonel in Chief? What does it stand for, why is it so celebrated and why is it so uniquely British? Julian Calder has observed the Parade and its rehearsals for over 20 years, photographing the spectacular pageantry and the minute attention to detail that contributes to this familiar annual event. 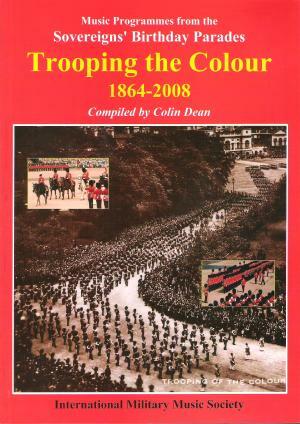 His photographs, and the accompanying text by Alastair Bruce, past commanding officers and serving soldiers giving the history and personal experiences of the Parade, demonstrate the pride, precision and performance that are synonymous with Trooping the Colour: the Parade which, in the minds of millions of British people and visitors, is at the heart of the United Kingdom. 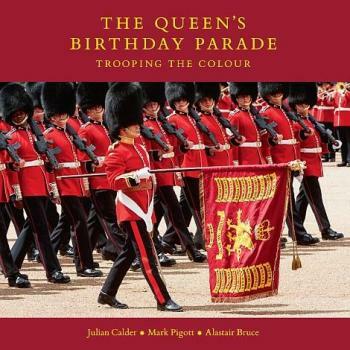 420 colour photographs including a unique portrait of HM the Queen, specially taken for the book, with soldiers from all the Regiments taking part in the Parade and their Colours. John Gleeson's painstaking research has uncovered a whole new picture of the band's formation and development over the past 332 years. March 2016 marks 100 years since the band's first public performance. 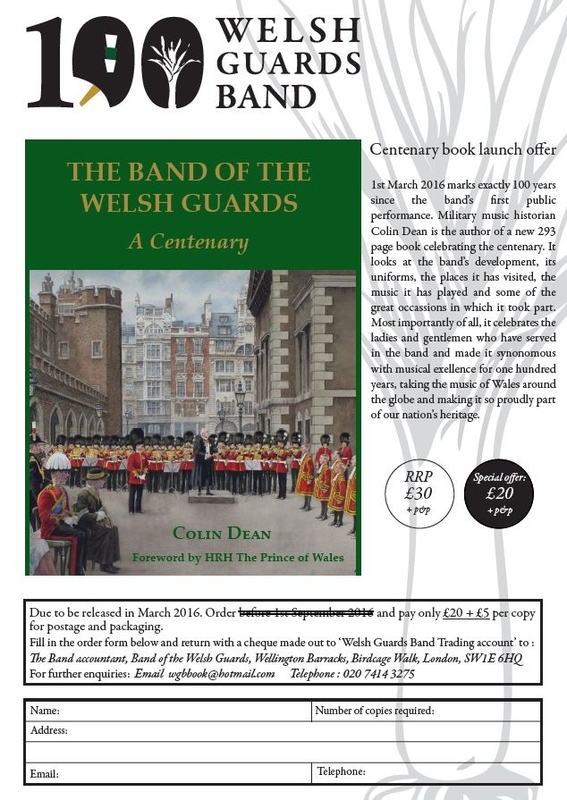 Military music historian Colin Dean is the author of a 293 page book celebrating the centenary. 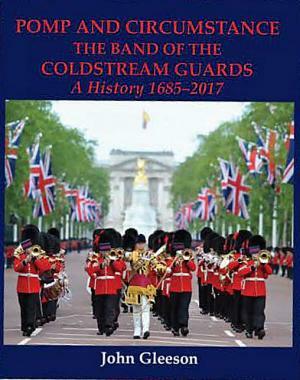 It looks at the band's development, its uniforms, the places it has visited, the music it has played and some of the great occasions in which it took part. 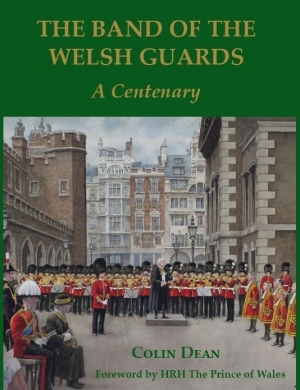 Most importantly of all, it celebrates the ladies and gentlemen who have served in the band and made it synonomous with musical excellence for one hundred years, taking the music of Wales around the globe and making it so proudly part of our nation's heritage. Still available at £20 + p&p. Click on the book cover above for more details and to order. 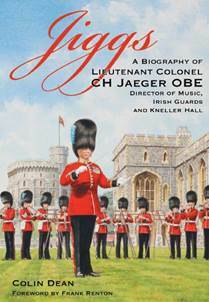 An extensive illustrated biography of the life, work and accomplishments of Colonel 'Jiggs' Jaeger. This year the British Forces Philatelic Service, in partnership with the Household Division Charity, will again be producing the official commemorative cover to mark Trooping the Colour at Her Majesty The Queens Birthday Parade. The cover will bear a 1st class stamp, cancelled using a unique British Forces Postal Service special handstamp No. 3216. The Colour will be trooped by the 1st Battalion Coldstream Guards and the cancellation features the regimental capstar along with that of The Household Division. The covers may be ordered from the BFPS online shop (www.bfps.org.uk/shop). They cost just £6 (unsigned) or £12 for the signed limited edition version. You can also order the covers by post by sending a cheque (payable to BFPS CIC) to BFPS CIC, The Old Post Office, Links Place, Elie, LEVEN KY9 1AX. These covers are always popular and are available whilst stocks last.